More Choices . . . We offer many styles of Monogram flags. Please note that both sizes are not available in every design. Many designs are also available in coordinating mailbox covers and floormats. 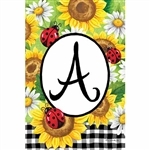 A - INDIGO BOHO Monogram Letter "A" Garden Flag 12" x 18"
A - SUNFLOWER LADYBUG Monogram Letter "A" Garden Flag 12" x 18"
A Fall Monogram Letter "A" Decorative - Garden 12" x 18" | $3 OFF ! A Fresh and Pretty Floral Monogram "A" Decorative Flag - Garden 12.5" x 18"
A Frolic Monogram "A" Decorative Flag - Garden 12.5" x 18"
A Gablecrest Monogram Letter "A" Applique Standard Flag - 29" x 43" - $5 OFF! A Grantham House Monogram Letter "A" Garden Flag 12" x 18"
A Lemonade Monogram Letter "A" Garden Flag 12" x 18"
A Pineapple Flowers Monogram Letter "A" Garden Flag 12" x 18"
A Southern Welcome Monogram "A" Decorative Flag - Garden 12.5" x 18"
A Stately Scroll Monogram Letter "A" Garden Flag 12" x 18" - $5 OFF! 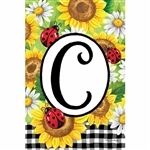 B - INDIGO BOHO Monogram Letter "B" Garden Flag 12" x 18"
B - SUNFLOWER LADYBUG Monogram Letter "B" Garden Flag 12" x 18"
B Grantham House Monogram Letter "B" Garden Flag 12" x 18"
B Lemonade Monogram Letter "B" Garden Flag 12" x 18"
B Pineapple Flowers Monogram Letter "B" Garden Flag 12" x 18"
B Southern Welcome Monogram "B" Decorative Flag - Garden 12.5" x 18"
C - INDIGO BOHO Monogram Letter "C" Garden Flag 12" x 18"
C - SUNFLOWER LADYBUG Monogram Letter "C" Garden Flag 12" x 18"
C Frolic Monogram "C" Decorative Flag - Garden 12.5" x 18"
C Grantham House Monogram Letter "C" Garden Flag 12" x 18"
C Lemonade Monogram Letter "C" Garden Flag 12" x 18"
C Pineapple Flowers Monogram Letter "C" Garden Flag 12" x 18"
C Spring Monogram Letter "C" Decorative Flag - Standard 28" x 40" | $6 OFF ! C Summer Monogram Letter "C" Decorative Flag - Standard 28" x 40" | $6 OFF ! D - INDIGO BOHO Monogram Letter "D" Garden Flag 12" x 18"
D - SUNFLOWER LADYBUG Monogram Letter "D" Garden Flag 12" x 18"